Billions will be allocated to fight the opioid epidemic under President Donald Trump's draft 2019 budget unveiled on Monday, while funding for public health programs and agencies are slated to be slashed for a second straight year. The president's plan calls for $68.4 billion to fund HHS in fiscal 2019, a 21% decrease over 2017 levels. Over the next two years, $13 billion will be funneled in efforts to combat the opioid epidemic. Last week Congress approved $6 billion over the next two years to fund programs aimed at combating use of opioids. That deal was part of the budget agreement to avoid a government shutdown. But advocates say anything less than the more than $32 billion a year the U.S. spends to fight the spread of HIV/AIDS would not be enough to make any significant progress on a problem that killed more than 64,000 in 2016. "What we are looking for is new, sustained funding that goes directly to local jurisdictions that are the hardest hit like Baltimore," said Dr. Leana Wen, Baltimore's public health commissioner, on Friday. "We have to take into account not only the cost of treatment but the cost of doing nothing." 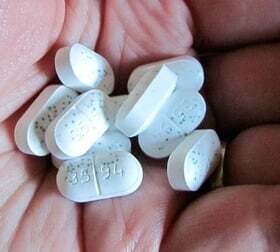 Federal funding of opioid efforts comes at the cost of further shrinking programs at the Centers for Disease Control and Prevention, as well as its workforce. The administration requested $10.9 billion for the CDC, a cut of more than $1 billion compared to 2017 funding levels. The president's budget proposes a 25% cut from the CDC's programs aimed at addressing chronic disease, a 50% reduction in the agency's public health preparedness and response programs, and a 40% cut to the CDC's National Institute for Occupational Safety and Health. The Agency for Healthcare Research and Quality will be eliminated and folded into the National Institutes for Health. That and closing the Low Income Home Energy Assistance Program will save $4.8 billion. The president's plan seeks to drop HHS' Community Services Block Grant program, which aims to address poverty; cut the Temporary Assistance for Needy Families by 10% from 2017 levels; and cut $17 billion from the federal food stamp program. That may set back efforts to address social determinants of health such as stable housing and food security. The 2019 draft budget cuts $451 million from health professions training and eliminates 14 such programs, according to the document. Trump's plan also seeks to "modernize" the public health workforce by utilizing the 6,500 members of the U.S. Public Health Service Commissioned Corps who are uniformed officers. The proposal did not specify what that means. The plan said an analysis was forthcoming and could result in actions ranging from phasing out some functions that it deemed unnecessary to creating a smaller corps focused on emergency response.